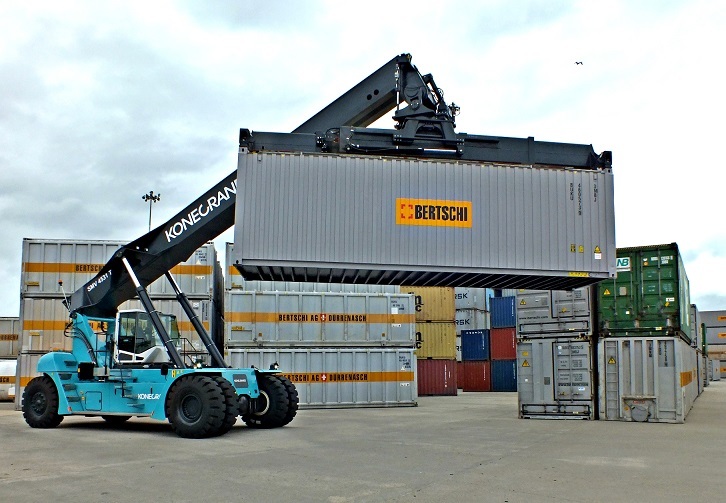 Konecranes Lift Trucks and Impact have worked together to develop a bespoke reach stacker for bulk logistics specialists Bertschi UK to ensure maximum efficiency at its Middlesbrough base. The 45 tonne reach stacker has a 33 tonne second row lifting capacity – two tonnes more than the industry standard for a truck of that size – and will be an integral part of an intensive workload of more than 200 container handlings per day. The Bertschi UK team asked Impact’s local dealer in the North East, Advanced Material Handling, to supply the machine tailored for them to stack their containers. As Konecranes exclusive distributor in the UK, Impact – along with Advanced – arranged for Bertschi UK Managing Director, Nick Brown, to visit the Konecranes factory in Markaryd, Sweden, to see the assembly process first-hand, test drive some trucks and to discuss the company’s specific requirements. He says: “I was seriously impressed at the factory visit. It was such a valuable trip to make for us and the passion and commitment from everyone involved from the outset has been outstanding. The Konecranes reach stacker joins a fleet of four container handlers in operation, all serviced and maintained by Advanced Material Handling. Bertschi UK was established in 1989 as a subsidiary of the Bertschi Group – a specialist in liquid, dry bulk and intermodal logistics, plus tanker cleaning and repair services. The group has more than 2,600 employees across 37 countries and operates more than 30,000 of its own containers for dry bulk and liquids.